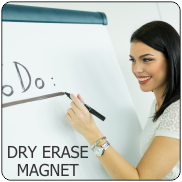 Magnetic Letters - Individual and Kits. Choose from Arial, Arial Black, Balloon, Cooper, Impact, Times Roman fonts. Available in Black, White, Red, Blue, Green and Fluorescent Orange. 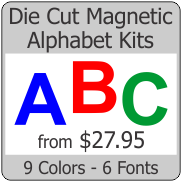 Sizes for alphabet magnets range from 1 to 8 inches. Magnetic Letters and Numbers - 1" Tall, 5 pc. Magnetic letters and numbers. Available in several fonts and colors. Sold in packs of 5 of the same .. Magnetic letters and numbers, sold individually so you can purchase exactly the combination you need..
96 pc Magnetic Numbers Only Kit 8 each 0 1 2 3 4 5 6 7 8 9 $ . Available in White, Black, Blue, ..
99 pc Magnetic Letter and Number Kit 5 each A E I L N O R S T 2 each Other Letters 2 each Numbe..
175 pc Magnetic Letters Only Kit 10 each A E I L N O R S T 5 each Other Letters Available in Wh..